Thankfully this holiday season has brought me plenty of relaxing and reflection time. Most of these times were accompanied by anticipated pancake breakfasts. Yet some were accompanied by candlelight due to nature’s form of diamond chandeliers. More thanks to having everything all powered just in time for the real festivities. Christmas went on as normal with lots of food and family (don’t worry I didn’t eat my family, although I may have been tempted to take a mental bite out of them at one point or another). Orange is actually one of my least favourite flavours as it reminds me of being a kid and having my packed lunch sandwich slightly orange flavoured from being squished against my clementine. I hated it. When I smell clementines, I don’t think of Christmas. I think of gross lunch bag sandwiches. But enough about that because this orange flavoured meal was actually appetizing! 3)Add egg whites, mix. Add other liquids (except ACV) mix. 4)Add apple cider vinegar and mix immediately before pouring onto frying pan. The orange tea adds a nice hint of flavour. A general reflection of the past year leaves me in a satisfied state. There are definitely areas where I could improve (like relationships), yet there are other areas where I have made great accomplishments (like in my career). I’m the type of girl who made resolutions even before resolution making was popular. Some call it dedication, yet I’m swayed to want to call it insecurity. For me I make goals/resolutions when I am not secure at the place I am and feel the need to achieve something to get to a better place. I had the pleasure of talking with the head gardener Carolyn about the gardens and farm. The most formal of the gardens was influenced by the horticulturist Alan who contributed not only a sensibility for gardens in the English manner, but also introduced biodynamic techniques to the farm. The plantings were carried out by Wendy Johnson. A circular yew hedge (Taxus baccata) surrounds the garden punctuated by flowering arbors on the four directional entrances. Carolyn commented that the yew hedge is rigorously pruned to keep it at its current height. Centering the garden is a Japanese snowbell (Styrax japonica) surrounded by low clipped hedges. Last year I also bought a good hedge trimmer from UK, which helped me lot in trimming my hedges and making it beautiful. In this post I will be discussing how you can buy a hedge trimmer in 2018. When you’re on the look-out for a hedge trimmer, it is very important to know exactly what kind of challenges it needs to face. It is very easy to purchase a model that doesn’t live up to your requirements, if you don’t take the time to do some proper research. You will have to accept some compromises, as each type and model comes with its on set of strengths and weaknesses. You want the most powerful trimmer out there? OK, but you will have to accept high levels of noise and possible arm fatigue. You want something cordless and light? No problem, but you will have to accept less cutting power. We will give you the need-to-know facts, which will make it easier for you to make the best possible purchase decision. Single- or dual-action hedge trimmer? Hedge trimmers are often referred to as either single- or dual-action. This is used to describe the type of cutting blades used. (the cutting blades sits on the “cutting bar”) On a single-action model, only one blade moves on the cutting bar. A dual-action model uses two cutting blades, that moves at the same time, back and fourth. This means, that you can cut in both directions. The dual-action models are the most popular, as they have proved to be the most flexible. On the other hand, some people think that single-action is better for more precise, straight cutting, mainly because of the lower weight of the trimmer. 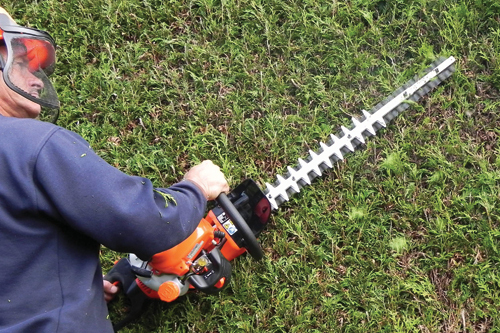 Hedge trimmers come with blade lengths, that range from 14 to 30 inches. A longer blade means more cutting power, and also you will be able to cover a larger area, faster. Logically, a longer blade also means a heavier trimmer. The most popular sizes seems to be 18-24 inches, so only choose the one with long blade, if you need to be able to reach high, and cut some thick branches. – A good weight balance. – Comfortable handles for the best maneuverability. – Blades that stops instantly, when the machine is turned off. – A safety shield, that can protect your hands from the blades. These kinds of trimmers are light in weight and easy to transport. They can weigh anywhere from 5 pounds to 10 pounds. The low weight makes them a good choice for people with limited muscle strength. Enough power for most gardening tasks. The cord makes them far less mobile than the petrol and cordless ones. It is easy to cut the cord by mistake, which means one has to be constantly aware of the cord, when using this particular trimmer type. These trimmers comes with a rechargeable battery. Hence, there is no cord required for current to work with these trimmers. If one compares the power of the trimmers, then obviously the corded hedge trimmers are more powerful, however, cordless trimmers are just much more convenient.. Batteries need to be recharges after every 40 to 60 minutes depending on how much work the trimmer needs to do. Keep in mind that the batteries in this type of hedge trimmer, often needs to be replaced after a few years. Lighter than petrol models. Won’t cause arm fatigue as fast. Battery runs dry pretty fast. 30-60 minutes usage, before recharging, is normal. Less cutting power than both electrical and petrol/gas powered models. Heavier than electrical corded hedge trimmers. They are comparatively heavy and make a lot of noise. However, they are very powerful. This type is the best choice for cutting the thickest branches. It takes some time to start these trimmers and regular maintenance of the engine is required. Because of the heavy weight, of this particular trimmer type, they can be exhausting to use for longer periods of time. More mobile than a corded (If you have the strength). Produces a lot of noise. Pollutes more than other types. My weight has been a monkey on my back since I was a pre-teen. I consider myself a strong, smart woman. I had a successful career in Manhattan, I’m married, I have two kids, I run my own business. But the one thing I cannot control, the one thing I cannot beat, is my obsession with food. I hide food. I binge. I go on diets and lose 20, 30, 40 pounds, only to slip up and gain all the weight right back. I started this journey yet again at my highest weight ever – 247 pounds. I’m not sure what’s going to make this time any different than the others. Maybe its this blog – even if no one reads it except me, at least I can dump all the crap here, rather than looking to food to make me feel better. Read More.